The department of the Navy (DON) will make the world’s largest investment in renewable energy by a federal entity. The DON plans to install a massive 210 MW (megawatt) solar energy farm in the Arizona desert, which is enough energy for 80,000 homes in California. Once operational, the solar facility will power a total of 14 U.S. Navy and Marine Corps installations in California (eight Navy installations and six Marine installations). 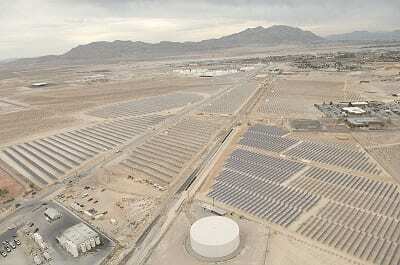 The Navy’s investment will extend the Mesquite solar farm. There are already two phases of the Mesquite solar farm in operation. Developed by Sempra U.S. Gas & Power, the 3,800-acre Mesquite Solar complex is located approximately 60 miles west of Phoenix, Arizona, where it is exposed to 300 days of sunshine annually. The entire complex has a full build-out potential of 700 MW, which would make it the world’s largest PV (photovoltaic) solar power installation when completed. The Navy’s deal to extend the complex and build Mesquite Solar 3 is the largest purchase of renewable energy that has ever been made by a United States federal government agency. The project will include the installation of 650,000 solar panels on ground-mounted, horizontal single-axis trackers. The solar energy project is expected to be completed by the end of 2016. Construction of the solar farm has already begun, and according to the DON, it is expected that Sempra U.S. Gas & Power will have the project completed by the end of next year, and that the project will create 600 construction jobs. Ray Mabus, the Secretary of the Navy, said that during its lifespan, the solar power project will save the Navy about $90 million. Furthermore, it will also prevent 190,000 tons of greenhouse gas emissions from being released into the atmosphere every year, which is about equal to removing 33,000 cars from the roads. According to the Navy, the Mesquite Solar 3, combined with its other solar energy projects that are currently in operation, such as at Camp Lejeune, North Carolina and Kings Bay, Georgia, will eventually result in the Navy procuring1.2 GW (gigawatts) of renewable energy power. Actually this solar energy plant near may not be the world’s largest as there is one in India the claims it’s the largest. Whichever plan you believe is determined by how one defines the word “largest”; in total acreage or in kilowatts produced.